Happy New Year, everybody! 2019 has finally arrived and our Society's visit to Australia is around the corner. Despite being the Australian winter, temperatures are expected to be between 64 to 80 Fahrenheit (18-27 Celsius), so dress accordingly! 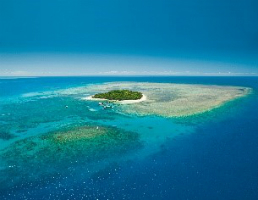 What's more, we will be at the entrance to the world's largest coral reef system, the Great Barrier Reef, so for snorkelers and scuba divers alike, we hope you'll make the time! With a packed meeting, once again spanning three concurrent symposia, there will also be plenty of opportunity to soak in the science too. We hope 2019 brings you all that you desire for both your professional and personal lives. See you in Australia. The first so called “Year of the Woman,” marked by the historic election of five female candidates to the United States Senate, took place in 1992 following the controversial Supreme Court confirmation hearings of Clarence Thomas. Now more than 25 years later, history as it so often does, has come to repeat itself with 2018 being proclaimed a second, seemingly more global, Year of the Woman. Unfortunately, in some ways it was déjà vu all over again with the Brett Kavanaugh Supreme Court Confirmation hearings culminating in the same unsatisfying result as the aforementioned proceedings. Some pundits may point to this moment fueling voter enthusiasm in the recent U.S. midterm elections, resulting in major gains for both women and underrepresented minorities. Yet, even before this singular event, there was a feeling that 2018 was going to be special. 2017 brought us the Women’s March, and the #MeToo movement became a phenomenon. 2018 saw this groundswell continue and ushered in landmark victories for women in global politics and international women’s rights. It was upon this backdrop that I too achieved my own, less internationally noteworthy, milestone of commencing my first academic faculty position. On April 2, 2018, I reported for my first day of work as a newly minted Assistant Professor at the University of Minnesota (UMN). My hire happened to be just one among a cluster of recruitments initiated at UMN to build a new Center on Addiction. Importantly, four of the six recent recruits were women and two from underrepresented minority groups. Not to mention, I can think of dozens of other young, female scientists who are excelling in academia in my own broader peer network. Therefore, I would request the latitude to rebrand or at least co-brand 2018 as the “Year of the Woman in Science.” With that in mind, the rest of this article will reflect on three lessons learned over the last year as one such woman in science at the beginning of what I hope will be a long, successful career. I hope these ramblings will resonate with all readers as much of the process is universal, but it is impossible to fully separate my gender from my life experiences. Yet, had I been asked how being a woman has impacted my career just a year ago, I might have responded that my gender had little to no bearing on my professional life, while my status as a minority played a much larger role. But in the past 12 months, in mostly subtle ways, I have become more acutely aware of the ways in which being a woman affects my profession. 1) Learn to say “no.” Full disclosure: I haven’t learned how to practice this yet, but I am pretty sure it is very important. This advice is universal, but I have a feeling that woman: 1) are asked to participate in more committees, etc. and 2) have a harder time saying no. We don’t have time here to get into the psychology of what may underlie the latter. As a new PI you will be busier than you have ever been in your life. I like to describe the experience as being a combination graduate student, post-doc, and professor. On the plus side, you do make more money to go along with these expanded responsibilities. On the minus side, the day does not actually get any longer than 24 hours. Of course, I am not the first person to set up a laboratory so I know that it CAN all be done. In fact, I am told that I am actually “on-schedule” (whatever that means) in terms of the progress that should be expected at this relatively early stage. So far, I am still managing to juggle everything, and it helps that my time is protected from teaching for setting up my research. But I know I am getting dangerously close to the tipping point of not being able to keep all of these balls in the air so, the next committee I am asked to join I will say no, politely. 2) Invest in peer networks. This one is gender neutral. ‘No man (or woman) is an island.’ I feel lucky to have started my position as a part of a cohort of other Assistant Professors. I have a built-in support group of people going through exactly the same thing right here, which has been extremely helpful. This is not the case for most people. It is important to cultivate strong working relationships with your colleagues and you will inevitably develop some close friendships, but it is probably not the best idea to constantly unload complaints on your co-workers. Thus, it is just as important to maintain your prior relationships and continue growing your peer network. These are the folks you can call to safely unburden yourself about whatever office politics might be irrationally irritating you this week without fear of repercussions. Additionally, you can and should leverage these networks to make important connections to continue advancing your career. 3) Project confidence. This is a simple, but powerful idea. The oft-cited Ehrlinger and Dunning 2003 study showed that women underestimate their abilities and performance, in this case on a science quiz, while men tend to overestimate both. Women are more likely to suffer from “imposter syndrome” discounting their own competence and self-worth and attributing success to external factors rather than deserved achievement. I do all of these things at times, and major transitions or promotions like the one I just experienced can precipitate such feelings. I know that in order to be successful, I need to overcome these false feelings and project confidence even when I feel those moments of self-doubt. Confidence matters just as much, if not more, than competence for both men and women at this level because we are all competent to have made it this far. Entire volumes have been written on this subject, so one brief paragraph does not do this issue justice. One bit of good news for women is that the confidence gap between men and women disappears over time, but don’t let important opportunities pass you by in your youth. Bonus. Don’t apologize if you don’t mean it. This one is actually just a pet peeve, and I feel like women display this behavior more often than men. This is another symptom of the lack of confidence mentioned above. Don’t be afraid to own your words/feelings/actions. Be willing to accept advice, but comfortable with rejecting it. I had a mentor that used to tell trainees “It’s your career,” and guess what? That’s true. Everyone is going to have an opinion about everything, but you must ultimately learn to listen to your own voice. References: Ehrlinger, J., & Dunning, D. (2003). How chronic self-views influence (and potentially mislead) estimates of performance. As so eloquently stated by Dr. Spencer, women have made remarkable strides across various occupations including politics and science. In an effort to highlight the exceptional work and experiences of women in science, IBNS News would like to dedicate a column to articles written by women where they share highlights of their research and scholarly findings, experiences as professors or students, and their efforts in science outreach. We hope that this column becomes an ever-growing reflection of the diversity of experiences that shape women in science, and provides a space in which these experiences (whether they are good, bad, or everything in between) can be shared and reflected upon. Interested in serving as a Guest Editor for the IBNS News? Looking for a New Employment Opportunity or Struggling to Find the Right Candidate? Meet the IBNS Career Center! One of the biggest challenges for any international scientific society is to provide quality and informative support to its members, whether it's for a new employment opportunity or finding the right candidate for a newly opened position. The IBNS online Career Center portal (http://jobs.ibnsconnect.org) provides the right tools for both job seekers and employers. The IBNS Career Center portal offers all the standard operational features; such as a thorough search engine by keyword and location, as well as a free review of your resume for feedback, and a job-posting service for employers. However, what makes the IBNS Career Center stand out in terms of support is two additional quality features: resources for job seekers & access to a resume bank for employers. In the Resources section, you have access to a number of articles with valuable tips in building a resume, job seeking, and communication. These tips come from experienced scientists in the field -- not only for searching or applying for a position, but also for the interview process. Interested in 'building your brand’ or strengthening your social media presence? You will find plenty of advice and tips to do so, which will help strengthen your image and move your career to the direction you want! In the Resume Bank, potential employers have free access to a large bank of resumes and profiles. You can customize the filters that apply to your search and create lists of candidates that fulfill your own criteria. In this column, we share the latest research, interesting scientific articles and news. Sage Therapeutics may be releasing the first pharmacological treatment approved explicitly for postpartum depression (PPD). The drug under review is brexanolone (brand name: ZULRESSO™), an intravenously-administered medication (see FDA Advisory Committee briefing document HERE). Approximately 1 in 9 women develop PPD following childbirth (Ko et al., 2017), and although currently available antidepressants are used as treatment for PPD (e.g., Selective Serotonin Reuptake Inhibitors; De Crescenzo et al., 2014), adherence rates for antidepressants are generally low (Hunot et al., 2007). Brexanolone is a synthetic positive allosteric modulator (PAM) at GABAA receptors that mimics the effects of an endogenous neurosteroid, allopregnanolone that is synthesized from progesterone. During pregnancy, levels of allopregnanolone and progesterone peak significantly, resulting in the down-regulation of GABAA receptors in several brain regions (Concas et al., 1998; see Figure 1 from Mody, 2019). 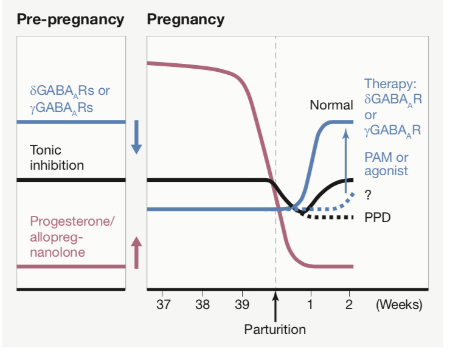 Progesterone and allopregnanolone levels decrease back to pre-pregnancy quantities almost immediately after childbirth, but the number of GABAA receptors take additional time to up-regulate. An inability to regulate GABAA receptor expression following pregnancy, in tandem with the sharp decline in allopregnanolone levels, may underlie the development of PPD (Maguire & Mody, 2008). Thus, brexanolone could decrease the likelihood of PPD development by compensating for the extreme decrease in endogenous neurosteroid levels that occurs after pregnancy. Does Brexanolone Reduce PPD Symptoms? Results from Phase 2 and Phase 3 clinical trials show that brexanolone reduced PPD symptoms, as measured by the Hamilton Rating Scale for Depression (HAM-D), in women with moderate to severe PPD soon after their brexanolone infusion (Kanes et al., 2017; Meltzer-Brody et al., 2018). It was also found that post-treatment HAM-D scores for women in the treatment groups remained the same (i.e., stable) 30 days following the brexanolone infusion. No deaths were observed during the clinical trials, and the occurrence of serious to severe adverse events was low in the treatment and control groups. Some of the adverse events included headaches, dizziness, nausea, dry mouth, fatigue, and pain at the infusion site. Brexanolone’s greatest benefit is that it is a targeted pharmacological treatment, rooted in the physiological differences that distinguish PPD from other depressive disorders. The rapid alleviation of PPD symptoms after infusion is especially promising as current antidepressants may take several weeks to alleviate symptoms. The lack of severe side effects are also of benefit as concerns about antidepressants (e.g., side effects, dependency) and uncertainty about, or preference for, other treatment options are related to low adherence rates (Hunot et al., 2007). Brexanolone, as with any other medication, is not without limitations. Although neurosteroid levels and GABAA receptor expression play a significant role in mood following childbirth, there are other physiological processes involved in the development of PPD. An example of one such mechanism is the hypothalamic-pituitary-adrenocortical (HPA) axis, which brings about another set of endocrine responses, receptors, and brain regions that complicate the development and maintenance of PPD (see Glynn et al., 2013 for review). Moreover, genetic predispositions to PPD likely exist as women with a former history of PPD are more likely to develop it again (Bloch et al., 2000); however, these predispositions are not well understood. Lastly, biological events do not occur in isolation. It is important to consider social and environmental factors involved in women’s post-partum experience that may exacerbate PPD development, independent of medical treatment. Bloch, M., Schmidt, P. J., Danaceau, M., Murphy, J., Nieman, L., & Rubinow, D. R. (2000). Effects of gonadal steroids in women with a history of postpartum depression. American Journal of Psychiatry, 157(6), 924-930. Concas, A., Mostallino, M. C., Porcu, P., Follesa, P., Barbaccia, M. L., Trabucchi, M., ... & Biggio, G. (1998). Role of brain allopregnanolone in the plasticity of γ-aminobutyric acid type A receptor in rat brain during pregnancy and after delivery. Proceedings of the National Academy of Sciences, 95(22), 13284-13289. De Crescenzo, F., Perelli, F., Armando, M., & Vicari, S. (2014). Selective serotonin reuptake inhibitors (SSRIs) for post-partum depression (PPD): a systematic review of randomized clinical trials. Journal of Affective Disorders, 152, 39-44. Glynn, L. M., Davis, E. P., & Sandman, C. A. (2013). New insights into the role of perinatal HPA-axis dysregulation in postpartum depression. Neuropeptides, 47(6), 363-370. Hunot, V. M., Horne, R., Leese, M. N., & Churchill, R. C. (2007). A cohort study of adherence to antidepressants in primary care: the influence of antidepressant concerns and treatment preferences. Primary Care Companion to the Journal of Clinical Psychiatry, 9(2), 91. Kanes, S., Colquhoun, H., Gunduz-Bruce, H., Raines, S., Arnold, R., Schacterle, A., ... & Hoffmann, E. (2017). Brexanolone (SAGE-547 injection) in post-partum depression: a randomised controlled trial. The Lancet, 390(10093), 480-489. Maguire, J., & Mody, I. (2008). GABA A R plasticity during pregnancy: relevance to postpartum depression. Neuron, 59(2), 207-213. Meltzer-Brody, S., Colquhoun, H., Riesenberg, R., Epperson, C. N., Deligiannidis, K. M., Rubinow, D. R., ... & Jonas, J. (2018). Brexanolone injection in post-partum depression: two multicentre, double-blind, randomised, placebo-controlled, phase 3 trials. The Lancet, 392(10152), 1058-1070. Mody, I. (2019). GABAAR Modulator for Postpartum Depression. Cell, 176(1), 1. All animals are motivated by food and hunger. The molecules of glucose that make up food are necessary to fuel all animal behavior. Without such fuel, animals would cease to exist. Humans, however, have elevated food from being just a source of energy to being a source of pleasure, culture, and tradition. We have done this through one simple act: cooking. Humans are the only animals that cook their food before eating it, and spend as much—if not more—time preparing food as they do consuming it. 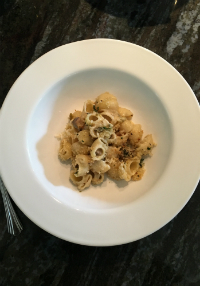 My interest in cooking stemmed from a culture that derives many of its rituals from food. My parents immigrated from India to the United States in the early nineties, and brought with them a rich tradition of feeding and being fed. I grew up eating Indian food, watching with awe as my mother somehow turned cauliflower and potatoes into a delicious curry (in Hindi, we call curry sabzi) and made fresh rotis to eat with it. My mother cooked to keep us nourished and well-fed, but my father cooked because he genuinely loved it. Whenever my parents threw dinner parties, my father would go to the grocery store and pick out the most select of ingredients, and curate and create dishes with the utmost love and care. In high school, I ventured into baking with my first cake, an apple cake, being so well-received that I still bake it to this day. It was not until college that my love for cooking savory dishes came to fruition. Though I had cooked a bit while living at home, I was on my own when I moved away to Philadelphia. In addition to squandering my dining hall swipes, I would also buy food from the grocery store and create dishes for myself and my friends. It became a ritual of mine to invite those friends to whom I felt closest and cook a meal with them, especially if they were having a bad day or feeling homesick. Cooking was and is more than a social venture to me. Through cooking, I can be creative. Though I am a fan of using recipes to aid my cooking, I always add my own flair, merging the flavors of my Indian home with the recipes that I love to cook. It is a pleasure to eat good food and watch others enjoy what I have made. It is an even bigger pleasure to know that I took raw ingredients and brought them together to create a dish that sings on its own. The joy of elevating vegetables, grains, and meats to something that makes people reach for seconds, even thirds, is indescribable. As a young adult in science, finding my path has been tumultuous, a feeling that I know many others share. In college, I knew that I wanted to go into medicine, but the prerequisite classes made me question my own intelligence. There were so many nights where I debated dropping out altogether. Cooking was with me the entire way. When I would call my mom upset about something, she would tell me to wash my face and make myself something delicious to eat. And without fail, she was right, creating something from scratch for my own sustenance brought me enough peace to assuage my fears and self-doubts. Cooking saved me, in a lot of ways. When I felt like I could not do anything else, I knew that I could cook. When people asked me to make them certain dishes, I was forced to see my own value, even in the times when I felt I had lost it. Whether it is cooking or running, yoga or singing, everyone can find something that they love and makes them smile, even in the worst of times. I know I did. In the end of it all, now that I am beginning my journey through medical school, I know that cooking will continue to be there for me. And hey, if nothing else, at least I have a hot bowl of yummy food at the end of the day. Something as abstract as a brain cell (to an introductory student that is) can be modeled with simple and inexpensive supplies (e.g., Play-Doh, pipe cleaners, beads). Allowing students to build their own model of a neuron (or better yet, a network of neurons) tests their understanding of the parts of neurons and, most importantly, how these parts work together for proper cell function. In more sophisticated activities where students are asked to build a network of neurons, they can showcase their comprehension of communication between neurons. Plus, college students tend to enjoy an arts and crafts project! Click HERE for some neuron modeling ideas. Although most introductory-level science courses (e.g., biology, chemistry) have a lab component, this is not the case for the majority of introductory neuroscience courses in the United States, as labs are typically reserved for upper-division courses. Dynamic processes such as action potentials are often difficult for introductory students to understand without additional, hands-on exploration. Luckily, Brown University has created a publicly available virtual lab that allows students to do just that. In this lab, students are guided through activities that explore various aspects of action potentials (e.g., resting potentials, refractory periods, and all-or-none responses). Click HERE to see the virtual lab. Long-term potentiation (LTP) is another multi-step process that often stumps students, but fear not, Play-Doh can be used to illustration this process, too. After discussing LTP during lecture, I pair students up and ask them to build a Play-Doh model of a pre and postsynaptic cell in the hippocampus. They start with two NMDA receptors and one AMPA receptor (represented by colored beads) on the postsynaptic cell. They are then guided through scenarios on a worksheet that result in repeated depolarization and eventually, addition of AMPA receptors. Students are required to answer content-based questions on the worksheet and are prompted to reflect changes on their Play-Doh model as they occur. Unless you have endless access to physical brains, the infamous brain hats are an exceptional (and fun) way for students to build their own brain model. Although these brain hats are limited to cortical anatomy, they can be used to emphasize fundamental aspects such as lateralization, the lobes and their functions, the surface of the brain (i.e., gyri and sulci), and the functional complexity of the cortex. Click HERE to see the brain hat instructions and templates. The brain hats take about 15 minutes to build (given the availability of supplies) so they can be built in class, which ensures that all of the hats are constructed properly (this can be challenging at first). Coloring the black and white version of the brain hats may take too long in class and works best if assigned as homework. Again, you’d be surprised at how much college students enjoy arts and crafts! The Whole Brian Atlas has an endless inventory of brain images. I have typically used the Atlas when discussing neuroimaging techniques, but I have been told by students that it is also a helpful way to review neuroanatomy. Click HERE to see their interactive simulation of a “normal” human brain. This stimulation can reinforce students’ understanding of brain structures by challenging them to identify structures that they know, and seeing how these structures can or cannot be seen through the different anatomical planes. Perhaps one of the best ways for students to understand the complexity of psychological disorders is to walk through a detailed case study that highlights the genetic, behavioral, social, and environmental factors involved in the development and progression of symptoms. The National Center for Case Study Teaching in Science has an endless list of case studies on several diseases and disorders (e.g., anorexia nervosa, depression, Parkinson’s disease) coupled with discussion questions and (sometimes) group activities. A large portion of the case studies can be downloaded for free, but you can also join through a subscription and gain access to all of the case studies and additional teaching resources. The Whole Brain Atlas also has images of “abnormal” or atypical brains from persons with neurological disorders. Specifically, they have “tours” of images from patients that had Alzheimer’s disease (Click HERE to see tour) and Multiple Sclerosis (Click HERE to see tour). These tours highlight some of the neurological markers of these diseases and reflect brain changes associated with disease progression. *The majority of these resources have been used in introductory neuroscience courses, but modifications/adaptations could be applied so that they can be used in upper-division courses. Current Editor-in-Chief of IBNS News, Dr. Davide Amato, was awarded the NARSAD Young Investigator 2018 grant for his research on neuro-circuitries of addiction in schizophrenia, which will be carried out at the Medical University of the University of South Carolina. Former IBNS President, Dr. Stephen Kent, was elected Chair of the Heads of Departments and Schools of Psychology Australia (HODSPA). The HODSPA is dedicated to the representation of psychology in Australian universities through a multifaceted approach that involves policy, research, professional training, education, and practice. See current books by our members! Congratulations to our 2019 Travel Award recipients! And a special thanks to the Education and Training Committee for dedicating their time to review all of the application submissions! "Avoiding danger and searching for safety: From predator-prey interactions in the field to anxiety disorders in humans." This workshop took place in the last week of August 2018 at the Institute for Pharmacology and Toxicology, Otto-von-Guericke University Magdeburg, Germany, and was mainly organized by Markus Fendt and Anke Frank (Zool. Research Museum Alexander König, Bonn, Germany). 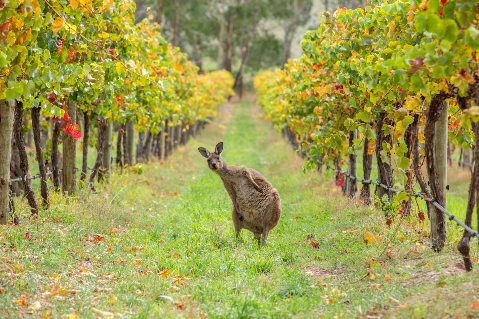 It was the 2nd workshop of a CEPPI (chemical ecology and predator-prey interaction) workshop series initiated by Anke Frank several years before, in Tasmania, with the goal to discuss current perspectives on the CEPPI field. This time, the research interests of the 14 participants ranged from behavioral ecology in the field, via behavioral neuroscience in the laboratory to clinical neuroscience in humans. As indicated by the title, fear and safety were the two overarching topics of the workshop. Fear is an evolutionary well-conserved adaptive response to threatening stimuli that facilitates the survival probability in dangerous situations. The opposing state to fear is the feeling of safety. Anxiety disorders are mainly based on a pathologically altered processing of fear and safety related stimuli. Therefore, the understanding of the mechanisms controlling fear and safety states in an individual is an important key to identify future treatment strategies for anxiety disorders. As indicated by the title, fear and safety were the two overarching topics of the workshop. Fear is an evolutionary well-conserved adaptive response to threatening stimuli that facilitates the survival probability in dangerous situations. The opposing state to fear is the feeling of safety. Anxiety disorders are mainly based on a pathologically altered processing of fear and safety related stimuli. Therefore, the understanding of the mechanisms controlling fear and safety states in an individual is an important key to identify future treatment strategies for anxiety disorders. To understand these complex states, they need to be investigated from different angels, in order to cover all aspects of them. The fostering of combining different angels of research and bridging the gaps between field and laboratory behavioral research was one of the main aims of the workshop. There were lots of fruitful discussion on these issues and everybody agreed that a better exchange between different lines of research is really needed to better combine the gain in knowledge and to overcome the immutable limitations of the different approaches. The key points of these discussions are currently transformed into a review article by the participants. In addition, potential future collaboration possibilities between field and lab research were discussed. Overall, it was a great and very fruitful workshop. The workshop was supported by the State of Saxony-Anhalt & European Regional Development Fund (Center of Behavioral Brain Sciences; FKZ: ZS/2016/04/78113), the German Science Foundation (SFB779, FE483/8-1) and the Zwillenberg-Tietz foundation. Save the date for this must-attend event! June 23 - 27, 2018, the 28th Annual IBNS Meeting is in Cairns, Australia. Be sure to keep checking the IBNS 2019 meeting page for frequent updates. What's on your bucket list? Here's an opportunity for great experiences and perhaps scratch off some of those bucket list items!